Bonnie Dwyer at the Green Tangerine Spa &Salon. The women sipping coffee beside the reception desk on a recent Monday morning, their hair sleek and shiny, looked like any other clients at the Green Tangerine Spa & Salon in Back Bay. But these clients were homeless, or not far from it, and having a stylist cut, color, or blow-dry their hair was a rare luxury. “You just remember you’re a woman,” said Diane Wayne, 62, who was left without a place to stay whenthe Long Island shelter closed abruptly last year. 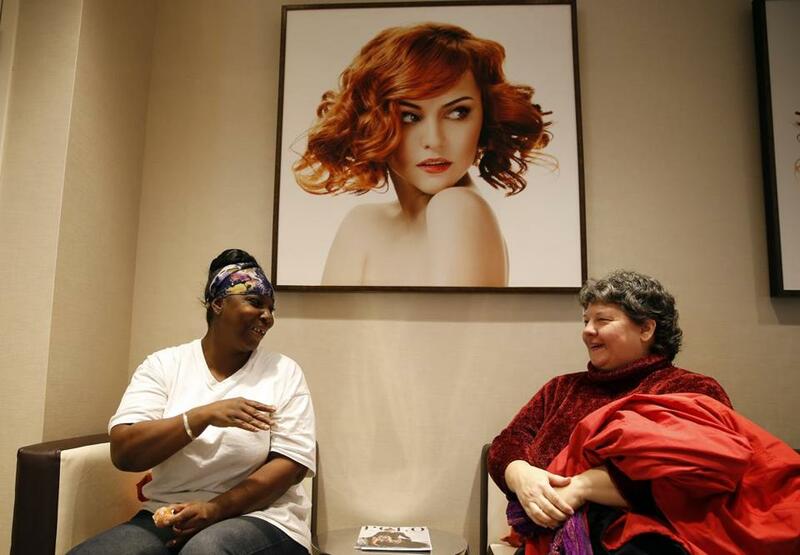 Wayne was there with other clients from the Women’s Lunch Place, a nearby day shelter that brings women to the Sheraton Boston Hotel salon for free treatments once a month. These are women who devote most of their energy to getting a meal or finding a place to sleep. For them, a little pampering helps restore a sense of dignity, said Elizabeth Keeley, executive director of Women’s Lunch Place. “We feel very strongly that it prepares them for moving forward in their lives,” said Keeley, noting that the shelter serves more than 200 women a day, a 50 percent increase from two years ago. 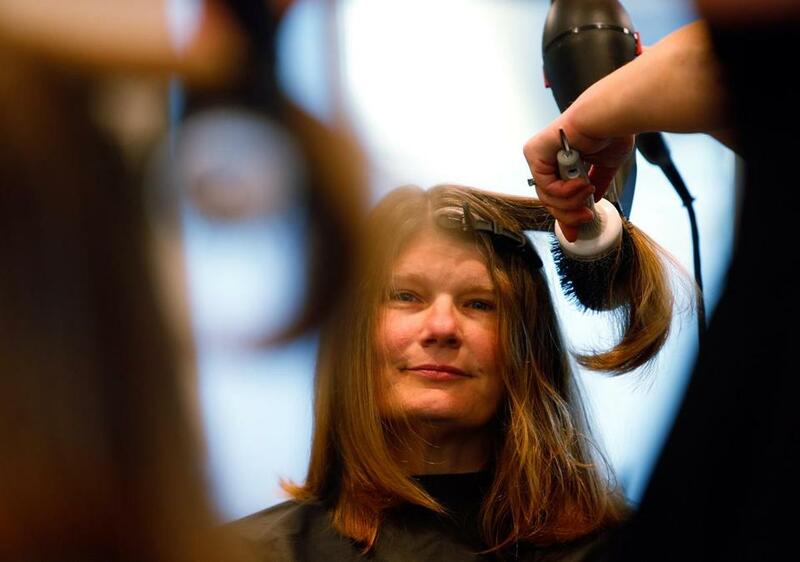 Green Tangerine, which started the monthly program as a one-time holiday service last year, has provided more than 100 haircuts and other services to Women’s Lunch Place clients. Giving back is a big part of Barsamian’s life. He also takes pediatric patients from Boston Children’s Hospital for rides in his Ferrari. “It feels wonderful,” said Cathy Cox (right), with Tonya Higgins at the Green Tangerine Spa & Salon. Green Tangerine isn’t the only local donor providing a bit of luxury to homeless and low-income women. At Women’s Lunch Place, each mother gets a rose, a scarf, and perfume on Mother’s Day, in large part courtesy of an anonymous donor. Birthdays are celebrated once a month with a cake donated by Sweet Tooth bakery in South Boston and costume jewelry from TJX Cos.
At Rosie’s Place, a shelter in the South End, the annual Day to Love Yourself features stylists, makeup artists, and massage therapists. Rosie’s Place also funds a yoga instructor who offers classes for women who have suffered trauma, as most of them have, at several area shelters, including Pine Street Inn and the Woods-Mullen Shelter. Back at the Green Tangerine salon, client Cathy Cox admired her short, wavy ’do in the mirror.